How much does Vietnam visa on arrival cost? When using Vietnam visa on arrival service, you agree to pay two kinds of fees: Service fee and Stamping fee. Service fee: is the fee you pay to us for processing the Visa approval letter for you. We will work as the connection between you (applicants) and the Vietnam Immigration Department starting from submission of your visa application to the Vietnam Immigration Department for checking your information, processing your visa application and grating your visa approval letter to getting the visa approval letter to return to your registered email. Stamping fee: is the fee you directly pay to the Immigration Official at the arrival airport to have visa stamped onto your passport. 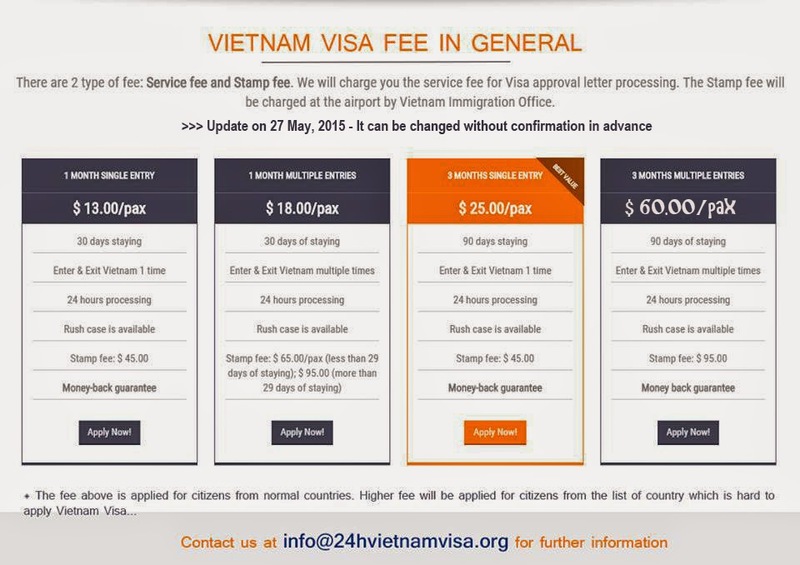 This fee is fixed by the Vietnam Ministry of Finance. It is 45 USD for 1 or 3-months single entry visa, 65 USD for 1 month multiple entries (less than 30 days) visa and 95 USD for 1 month multiple entries (more than 30 days) and 3 months multiple entries visa.